Last night, after finishing the bodice on Simplicity 2151, a princess seamed blouse, I was feelin’ the love for sewing. It fit like a glove. I couldn’t believe how fortunate I was going to be to have two winning projects in a row. I was practically smug. Well, what a difference a day makes. After setting in the sleeves today, I tried it on. Hmmm. Something was not quite right about it. Here’s the finished blouse. I can’t quite put my finger on what’s not working. Oh no! This looks like something Laura Ingalls’ schoolmarm would wear! NOT the look I was going for. I know I used a quilting cotton, but good heavens, it might as well have been a true calico. I knew the fabric was heavy for a blouse, so it almost feels like a lightweight jacket. But that is clearly not the main problem here. The main problem is the fabric pattern and color. Dreary, dreary, dreary. I had thought so when I finished the skirt. But I’ve worn that several times with a sweater, and it was OK. But I cannot currently conceive of under what circumstance I could wear this blouse in public. The fit. It’s very, very good (better on me than on the dress form). As I mentioned previously, this is a Simplicity Amazing Fit pattern. The only adjustments I made were to choose the D cup front pattern pieces and lower the bust projection 2 inches. I thought the ease would be way too much (according to the pattern 4½ inches at the bust), but it seems just fine. Oh, and I lengthened the sleeve 2 inches. I made a similar sleeve years ago and found I couldn’t bend my arms without unbuttoning the cuff. Two extra inches were perfect on this. The neckline. I LOVE the neckline. The length. The blouse is an excellent length for tucking in. Usually I have to lengthen blouses, but not this one. The shoulders are too wide. I don’t usually have that problem, but I’ve already adjusted the pattern for the next go around. The sleeve ease. It seemed a teensy bit too much. According to my measurement, narrowing the shoulder width just by redrawing the armhole seam front and back seems to have lengthened that seam, so that problem may be resolved. The cuff being one pattern piece that folds in half. It was supposed to be fully interfaced, but I didn’t have enough for that, so I only interfaced half. That was plenty. I’d like the cuff to be two pattern pieces so I could cut the facing a little smaller. The sleeve style. It’s pretty in the sketch, but I’m not sure it works on me. It could just be the weight of the fabric, though. I’ve tried to figure out what would make this blouse less Little House on the Prairie, but I’m at a loss. Maybe it would look better with pants, untucked. My daughter (just shy of 14) suggested that if I were someone else I could wear it with skinny jeans. Um, no. I found the perfect accessory, the apron I made in serger class several years ago. If I’m going to go through all the trouble of making a wearable muslin, I should put more effort into making it wearable. Which means casual low-cost apparel fabric, but quilting fabric is so much easier to find. My coral polka dot top is quilting fabric, and I like that a lot better. Regardless, I’m going to stay out of that section for a while. It works for cute skirts, but I think that’s it. So now, I need to decide on the next project. Do I make the skirt up in the nice poly-wool crepe I found? Do I remake this blouse in a pretty white or ivory blouse-weight fabric? Or do I move on to try to perfect another garment for my Vintage Separates Project? 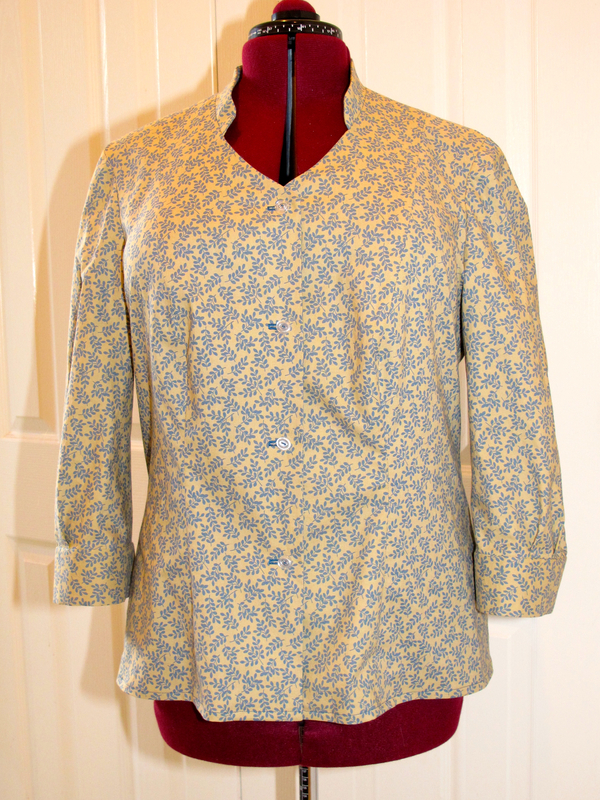 I have the Sense & Sensibility Patterns romantic blouse on order. Katrina at Edelweiss Patterns made it up as a gorgeous 1940s style blouse and really liked the pattern, so I’m inspired to try it. Meanwhile, if anyone has any ideas on how I could leave the house in this blouse, please let me know! Gemini note (because it’s not all about the sewing): Buying a new bike for my 8-year-old son has inspired me to get back into bike riding. My daughter has been using my abandoned one for the past year or so, but my husband got her a new bike. So, I took back possession, only to remember why I stopped riding it. The seat (saddle in bike-speak) is quite uncomfortable! A new one with rave reviews on Amazon is on the way. Bike riding, it’s good exercise, it’s vintage. What’s not to love? So the question on deck is how to make this blouse wearable. I’m thinking some Anthropologie styling. Looking at the positives. The neckline is fabulous. It went to the Prairie with the sleeves. I would remove them, find a crochet or open-knit white or off-white fabric and substitute them. Some contrasting buttons may or may not work as well. I would not give up. Other than the sleeves, I think you have a winner. Probably worn with a nice little skirt or white jeans, this can be super cute. I tried to find a current Anthro offering to use to compare, but nothing quite fits the bill right now on their website. Lucky Lucy, you are so right about the sleeves. Great ideas! Thank you so much for the time you put into looking at Anthropology. You give me hope that I can make it wearable. I’ll keep my eyes peeled for fabric and inspiration. I really like the button idea too. What about trying it with a really striking cardigan- a bright red maybe? Great idea, Sarah! Anything that eliminates or hides the sleeves is the key, I think.